their vegetables when they get a whiff of this Chinese dish with twist. 1. 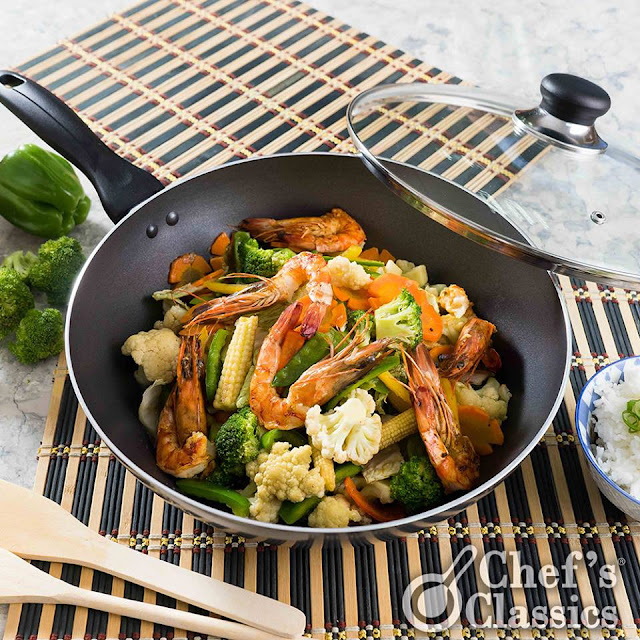 Heat Chef's Classics' Daisy Wok, then saute the garlic and onion in sesame oil. 2. Add the boneless chicken and saute for 2 minutes. 3. Put in the chicken liver and let it simmer for a minute. 4. Pour in the shrimp juice and 1 cup water. Bring mix to a boil. Cover the wok and simmer for 5 minutes. 5. Add the shrimp then season with some salt and pepper. 6. Add the oyster sauce. 7. Put in the cauliflower, young corn and cabbage then mix well. 8. Add the carrots, snow peas and bell pepper. Cover the wok and simmer for about 2 minutes. Be careful not to overcook the vegetables. 9. Dilute the cornstarch in ¼ cup water then pour the mixture into the pot. Mix well. 10. Turn off heat and serve with steamed rice.